Callie Leuck | Write On! : Dear diary, am I going crazy? 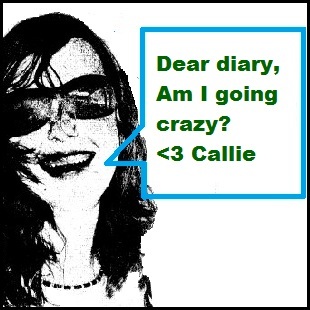 Dear diary, am I going crazy? Well friends, 2012 has been a lovely long year, indeed, but it's high time for it to be over. I'll be ringing in the new year with some new friends, after a restful visit with my family that included visits with high school and college friends. All in all, it's been a very enjoyable month post-thesis! With so many writing-related goals met this year, it seems relevant to reflect on myself as a much younger aspiring writer. The following quotes are pulled from my high school diaries, which are overall extremely terrible reads that belong in a bonfire, but that is another matter entirely. These excerpts are all related to writing and amused me, so perhaps they will amuse you. "We have also talked about semicolons; Mr. Richards is encouraging us to use them more often. If I am using them correctly is a different story." "I’m sorry for writing so much about my writings, but it’s what I do. Granted, I haven’t gotten much done recently, but I think about it often." "Also, now I have to read 'A Portrait of Dorian Grey' because I promised an imaginary person I’d read it. Am I going crazy? I don’t think so, because I know he’s not real, but still..."
"I think I am in love with Christopher Paolini. Kidding, kidding!" "I had been toying with the idea of applying a lunar calendar rather than a solar calendar but I think I would confuse myself too much. It would be way too much effort with no real result." "Well, it’s time to switch pens – green journal pen for black writing pen. I think I’m becoming obsessive about pen colors. A few weeks ago, I wouldn’t even write in this journal until I found this green pen. Does that make me crazy?" Yes, as a teenager I spent a lot of time wondering if I was crazy. I don't wonder anymore; I know.